I look forward to having you back again at The Arts Center. 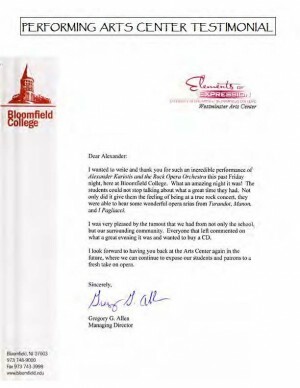 I wanted to write and thank you for such an incredible performance of Alexander Kariotis and The Rock Opera Orchestra this past Friday night, here at Bloomfield College. What an amazing night it was! The students could not stop talking about what a great time they had. Not only did it give them the feeling of being at a true rock concert, they were able to hear some wonderful opera arias from Turandot, Manon, and I Pagliacci. I was very pleased by the turnout that we had from not only the school, but our surrounding community. Everyone that left commented on what a great evening it was and wanted to buy a CD.